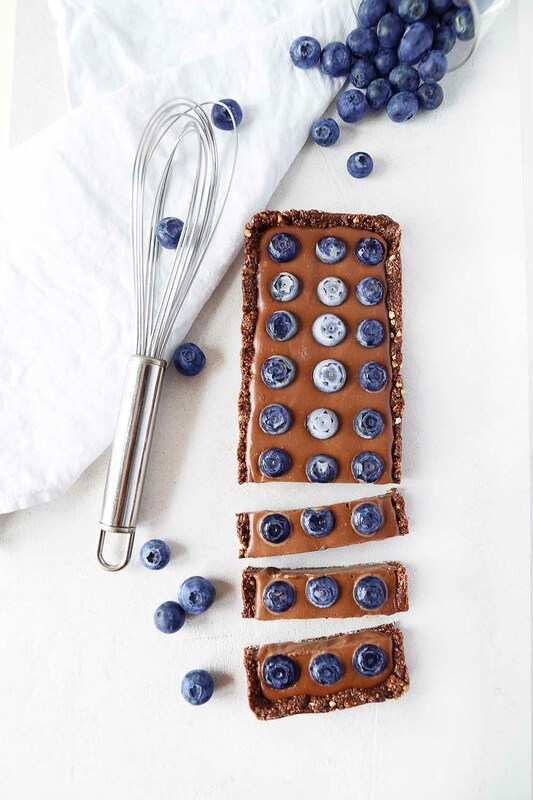 Creating a super easy, no bake chocolate tart with a crunchy crust, chocolate mousse filling, and fresh blueberries as a topping. I actually surprised myself with this creation. The moment I thought through the recipe, the tart was almost made. That was the moment I had my super last minute I forgot my best friends birthday “pie”. I think since then I recreated this tart in all shapes and sizes and for a bunch of different occasions. You know how much I love chocolate, and when a recipe is good, it sticks to my mind like glue. I also like the fact that it’s a really easy pie that not requires fancy ingredients. If you are already kind of into healthy baking, you might have all ingredients required at home. For me, I had everything in my pantry, except for the coconut milk, which I have used for my last curry. Mhh that was delicious! Make sure you use a full-fat coconut milk, as otherwise your cake might float the whole fridge. 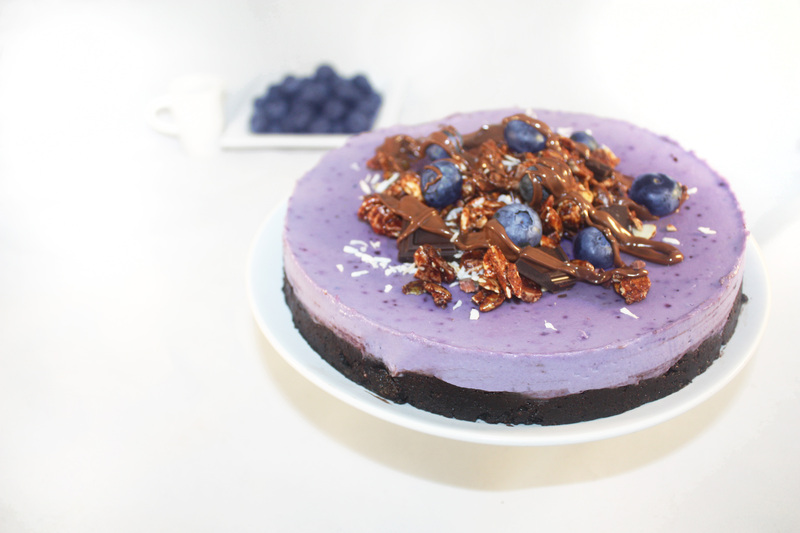 Oh and if you are more into Strawberries than Blueberries, make sure you also check out my Vegan gluten-free double chocolate mousse tart! Have a great day all you amazing people! Sending hugs from (today) sunny Switzerland. Put coconut, oats, cacao powder, maple syrup, vanilla extract and salt into your food processor and pulse briefly to mix. Add the pitted dates and process until the dates are finely chopped and the mixture starts to clump. Press into a 20cm (8 inches) flan, cheesecake or springform tin and leave in the freezer to firm a little while you prepare the filling. Heat the coconut milk and the coconut oil in a small pot and then pour over the chocolate. Then mix carefully until all the chocolate is melted. 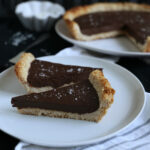 Add vanilla and cacao powder and agave syrup and then pour the chocolate ganache evenly over the chilled crust. Chill in the refrigerator for 2-3 hours until the ganache is firm. Hi Helene! Totally legit! I am in love with many desserts so I totally understand you ❤️ I can’t wait to see a picture of your creation! Have fun! I’ve been eye balling this recipe for a hot minute and I was reading through the recipe again and realized that I ACTUALLY HAVE ALL OF THE INGREDIENTS! Making this ASAP! Thanks Lara, this is so gorgeously striking and delicious looking I fell in love. Can you fall in love with a dessert? Because I did. Fresh ones but they got frozen cuz I froze the tart ???? Thanks so much Hana! Love your page! the sweetener doesn’t matter. 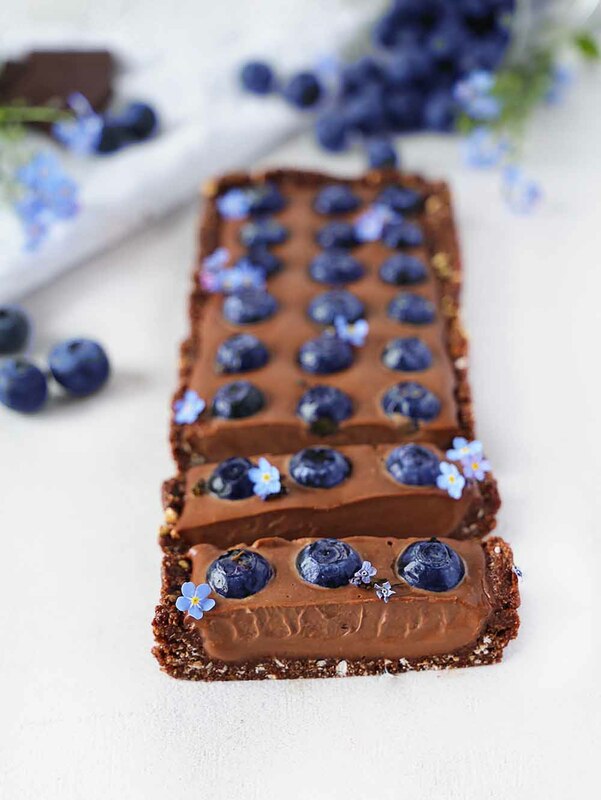 Take what you like 🙂 The blueberries come in when the chocoalte is firm enough to place them but not hardened completely yet. That chocolate ganache filling is so luscious and decadent looking. I just want a spoon, or a napkin after I face dive right into it! Das werde ich auf jeden Fall mal beim nächsten Familienfest ausprobieren *_* Danke für die tolle Inspiration! 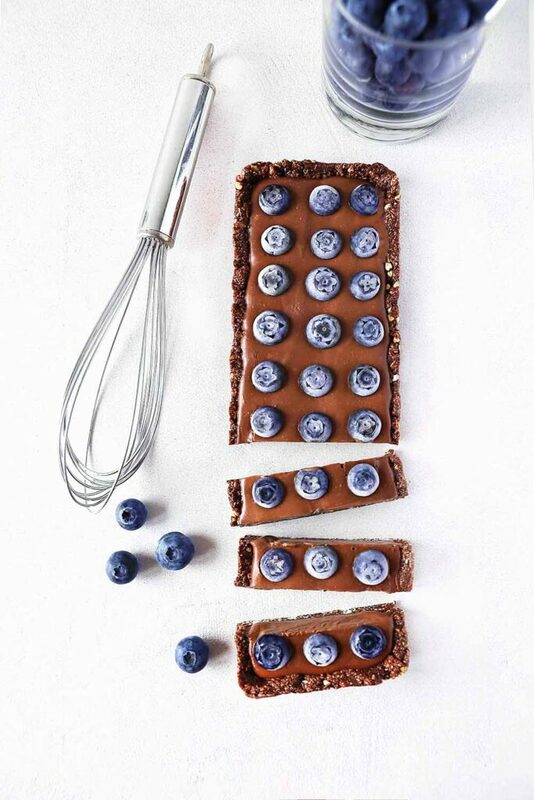 this tart looks SO good. 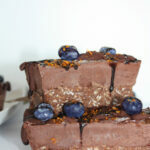 love that it’s raw too – i haven’t tried making a raw dessert before! Wow, this looks beautiful! Did your friend really like this tart? Maple syrup or agave? When do the blueberries come in?